Today we arrived in Mykonos, a popular Greek island for tourists. Everyone was excited to get out and explore after our previous day at sea. Hillary and Susan wanted to walk through the town together, shopping and sampling the local food. Mike, Amy and myself planned to take the kids to a beach for some swimming in the lovely blue Mediterranean waters. We had done some research the day before and decided on a beach which was slightly farther away, possibly less crowded. Mike wanted to give David a thrill by renting a scooter for touring around. Amy and I planned to take Megan and Kate on the bus and meet up later. We had all been informed by the cruise director that Mykonos was originally designed with natural foils- winding streets and alleys which were not laid out in any logical manner- in order to prevent capture by invaders. He promised us that we would get lost. Sure enough, while searching for the bus depot, we seemed to wander in circles, passing points over again until we got lucky enough to spot the buses. The schedule was complicated to figure out and led us to believe we had just missed the bus to our destination and would have to make other plans. Just then we saw Mike and David filling up their gas tank nearby. We told them our new plan and they said they would meet us there. When the bus arrived a few minutes later, we saw that it was in fact going to the beach we had preferred to visit. Oh well, so much for meeting the guys. At least they had a scooter and could get around on their own. We were stuck with where the buses went. We had a comfortable ride up and down the coast of the island and could appreciate the layout of the different beaches. We arrived at our stop about 20 minutes later. The turquoise water was very inviting and the warm sand felt soothing between our toes. Unfortunately, our reverie would soon have to end in order to catch a bus back to our cruise ship. We collected our things and headed to the washroom. When we walked into the cafe, lo and behold, Mike and David were sitting at the counter having some sandwiches! Apparently they had gone to the beach we told them, discovered we had not made it and decided to come here anyway. The funny thing is that they had not even considered looking for us on the beach,because we had stayed close to the moped parking area just in case. We had to get going though, so we headed to the bus stop and then took the return trip back into town. Now all we had to do was rewind our steps through the maze to locate our loading area. At one point we came to a fork in the road. We were not sure which way to go and Amy suggested walking out to the water to get an idea of where our ship was. We passed through an outdoor cafe to the seaside lookout. We spotted our cruise ship and knew the general direction to head. As we walked back through the cafe, Megan spotted her Grandma and Nana sitting at the table an arms reach away! They were so surprised when she gave them a hug! We pulled up some chairs to join them and told them about our earlier meeting with Mike and David. Of all the places where the reputation was for getting lost, we had some pretty remarkable encounters! We spent a half hour or so, sharing our adventures over some Mojitos and lemonades. It was funny to think what the chances of meeting up were, especially if Amy had not insisted on looking for the ship. When we got our bill, we were dismayed to learn that our Mojitos were outrageously expensive (12 Euros each). Fortunately, the ambiance of our gathering- surprise, family, view- made the whole experience “Priceless”. 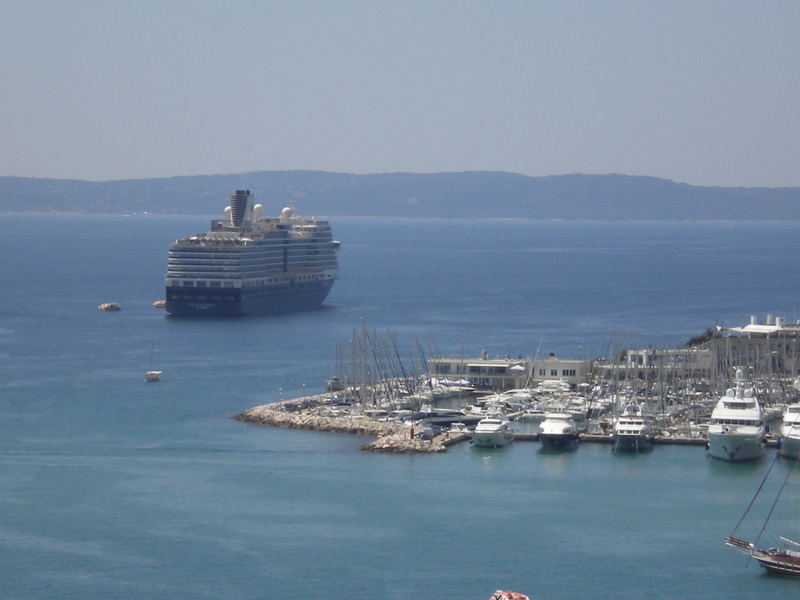 This morning we docked in Piraeus, the port city of Athens. 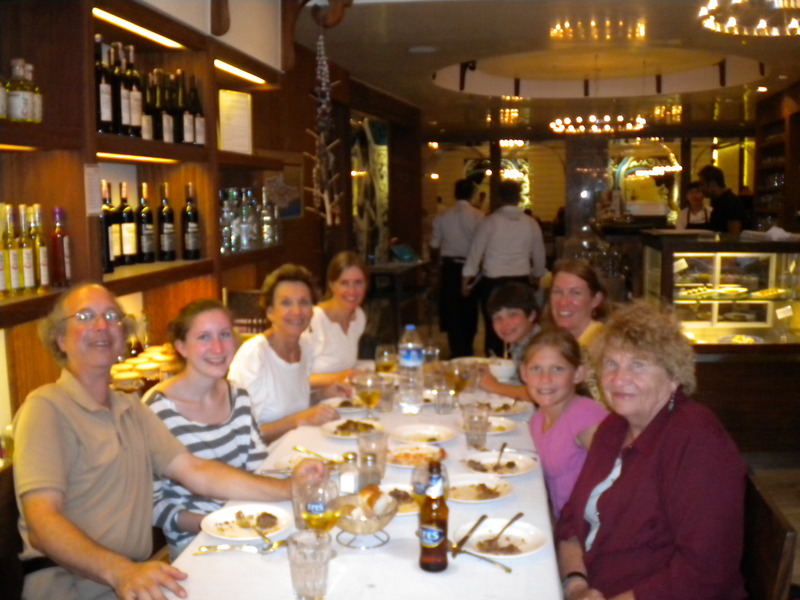 The Cruise family, Susan and Kate were in a rush to disembark. We had to catch a train in order to meet up with our tour guide. 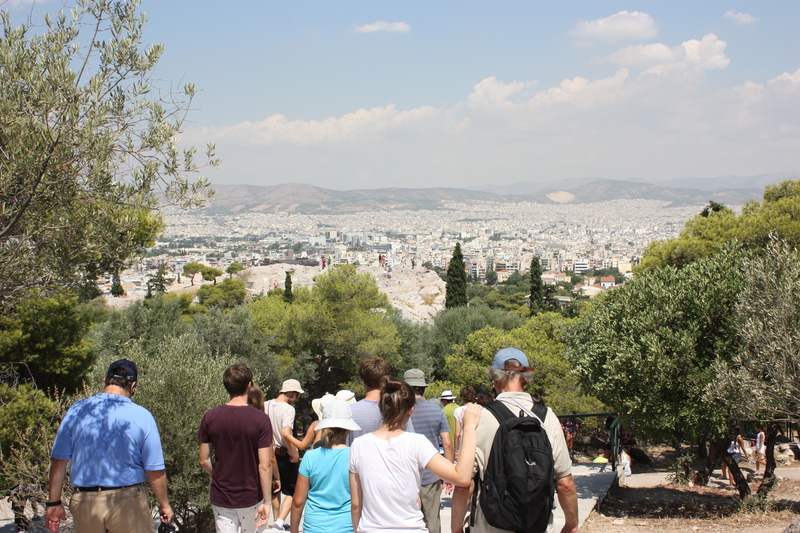 Mike had arranged a private tour with some local archaeologists to take us around the Agora and the Acropolis. We got slightly lost when our train was detoured to a different stop than planned, but we arrived at our meeting place only a few minutes late. Unfortunately, no one else was there. Mike spoke with a local shop keeper who was happy to let him use the phone to call our guide. It took over a half-hour to determine that no one had been sent for us and we would have to take the tour on our own. Mike was extremely disappointed, but we all let him know we appreciated his efforts and would make do. 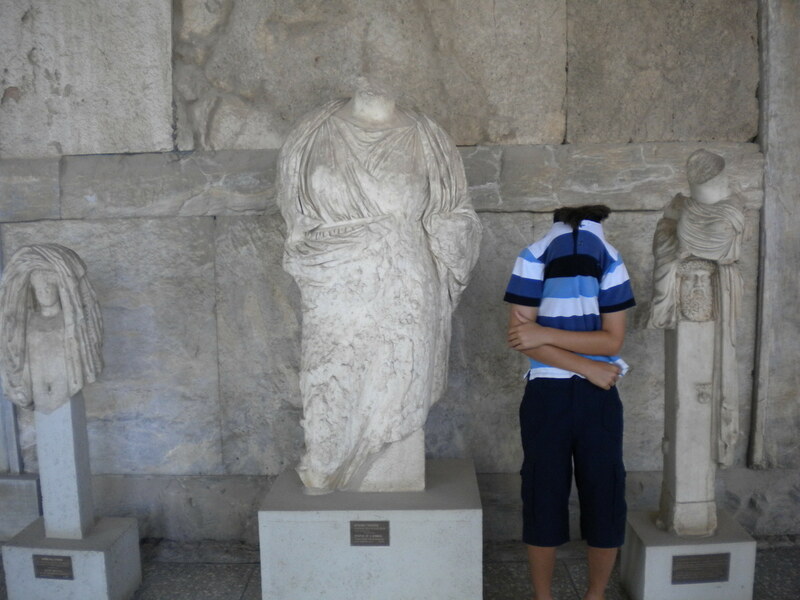 Kate and David had fun running amongst the statues, comparing their heights to the headless figures. Susan and Megan were deep in contemplation over what it took to build these sites; while Mike and I marvelled at how amazing it was that they were still around. 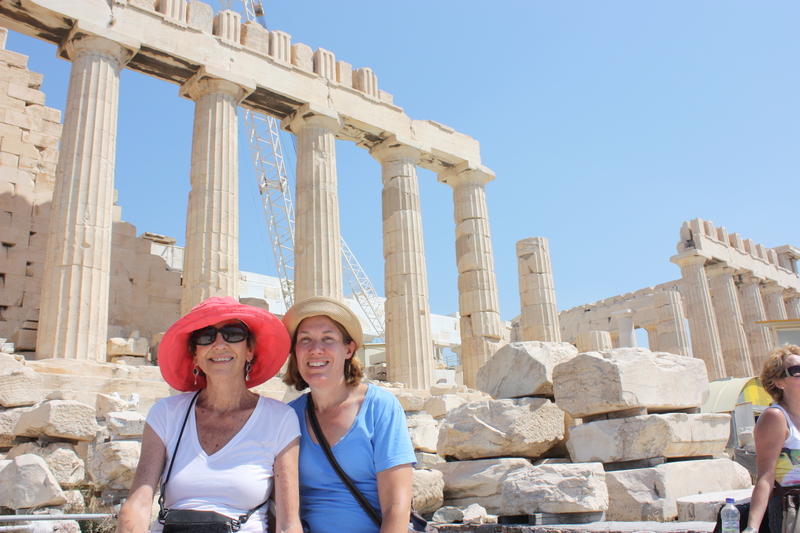 It was getting hot, so we decided to go to the top of the Acropolis before it got any later. Much to our dismay, we realized the crowds were growing large and there was no way to avoid them. The children were very patient and calm, even though we were wedged into a mass of strangers speaking many languages. The adults, however, were secretly panicked. We mentally divided up into partners, each with a child, whom we would protect in the event of a stampede (I know, we all have dark thoughts and worse case scenarios running through our heads). By the time we gained access to the historical site, we were stressed, dehydrated and needed a break. Poor Kate had been such a trooper standing in line, but at soon as we broke free, she needed to sit down and take some Tylenol for her headache- which had started during the hour-long wait. Almost at the same time, Amy called us on Mike’s phone. She and Hillary had met up with some old family friends who were visiting relatives near Athens. 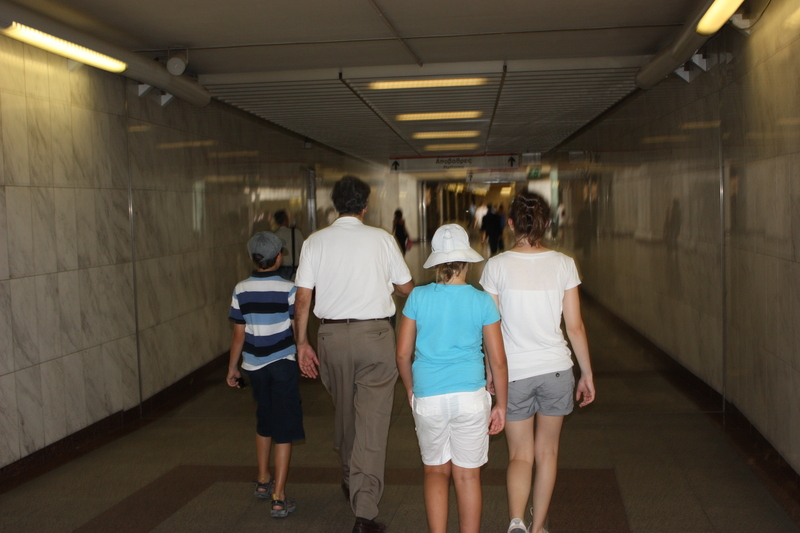 They had come to the city for the day to take them out to some museums and lunch. When we relayed our misfortunes to Amy, our friend insisted on coming to “rescue” us and bring us to lunch as well. By this point, we had had enough heat and crowds so we did a quick walk through of the Acropolis, took our mandatory photos and actually felt thankful that we didn’t have to stop at each ruin to hear a detailed explanation. We met up with Amy and Demetrius, a now 60-something gentleman, but just as charming as I remembered. He greeted each of us with a big hug and his signature Greek kiss, one on each cheek. He gave us a local tour on our walk to the museum. 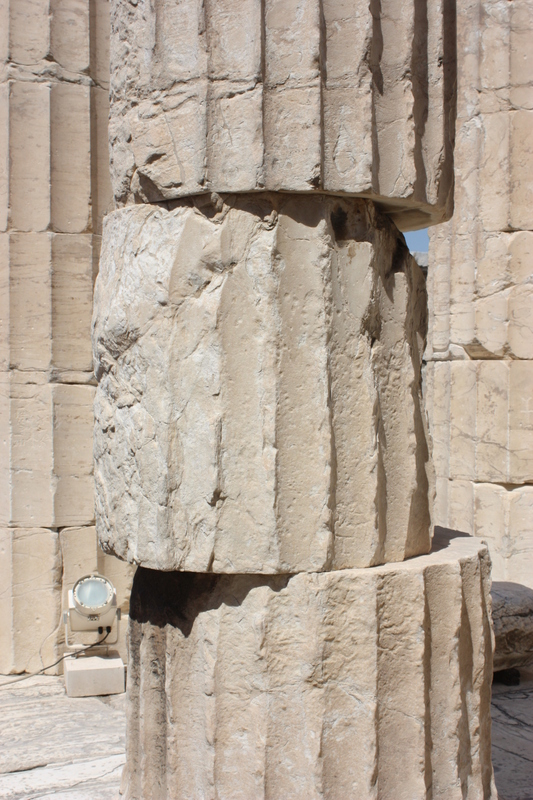 He had grown up in Athens and his descriptionof how it had changed was almost more meaningful than seeing the ancient ruins. Demetrius and his wife were the picture of Greek hospitality. They were both so delighted to have us on their turf- although we felt ashamed we had come all the way to Athens to catch up, when we could have seen them in New York. We enjoyed a delicious lunch- Greek salad, soup, lamb or pasta and a refreshing beer or lemonade to revive us after our stressful morning. We spent an hour talking and exchanging family updates. The children heard stories about their parents and came to realize that these kind people actually knew a lot about them. When it was time to head back to our cruise ship, Demetrius made sure to get us on the proper train with directions to our stop. We all vowed we would do a better job keeping in touch. It is so wonderful to reconnect with old friends and realize why you were friends in the first place. Now it is up to us to cement that bond, and not just on Facebook. I don’t think eFriends give out Greek kisses, at least not last time I checked. 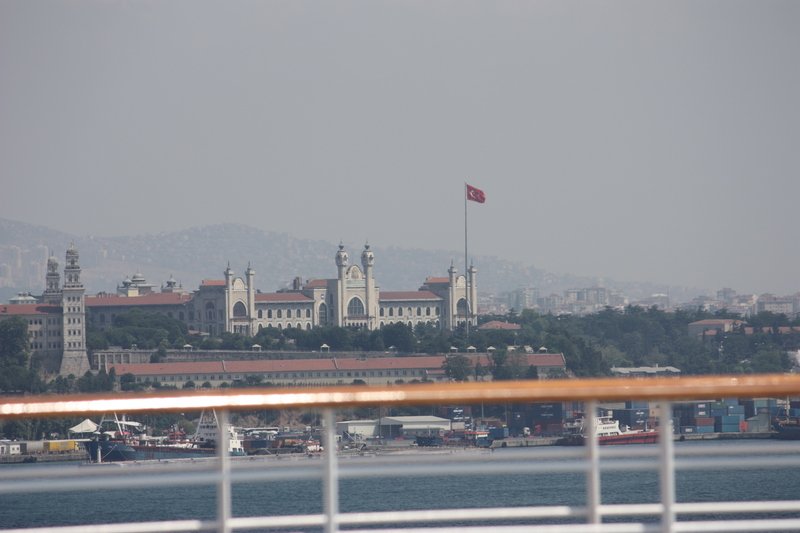 We docked in Istanbul this afternoon, sailing into the port which proudly sported the Turkish Star and Crescent. 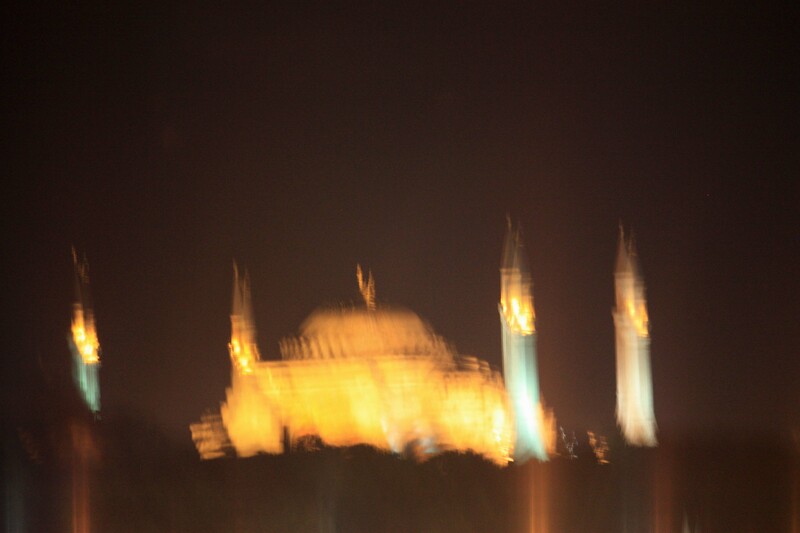 We had great views of the Blue Mosque and the Hagia Sophia from our starboard side verandah. Amy had a friend who lived in Istanbul. We were not able to meet up with her, but she had made a dinner reservation for us and we were looking forward to a real Turkish meal. We had some time to spare before dinner though and most of us wished to wander around the city. Only Hillary and Kate stayed behind as they were a bit jet-lagged and wanted to save their energy for our big shore excursion tomorrow. Everyone else headed over the bridge that crossed the Bosphorus. The walkways were loaded with fishermen trying to pull in something big enough for dinner. The women were dressed in a variety of styles- ranging from jeans and tank tops to full burkas. I guess I neededn’t have stuffed a scarf in my bag since we were not going to the mosque today. We reached the Spice Market- a very traditional building with exquisite mosaic designs, and walked inside to see the most amazing arrangements of a different kind. 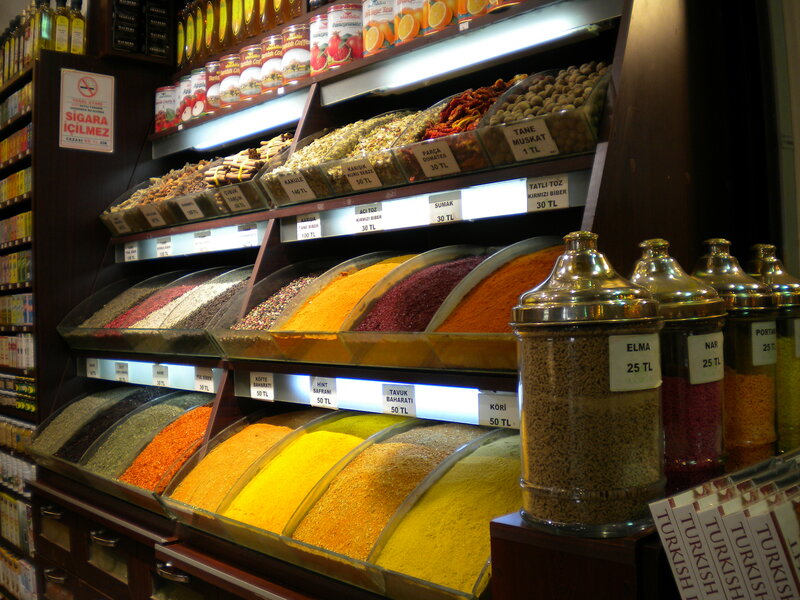 There were fresh spices of every color, stacked in open bins, with their fragrant aromas spilling out into the air! It was hard to resist buying bags full of every imaginable flavor. My husband was smart not to give me any of the Turkish Lira he had exchanged. So all I could do was take it in with my camera and breathe the air. We caught a glimpse of the neighborhood where our dinner reservation was- up the hill by the Galata Tower. When Amy and I realized how steep the walk would be, we became concerned that Hillary would have trouble because of her knee. We knew the kids could manage just fine and Susan, who had been a good walker all her life, was getting stronger every day. We decided Susan & I would walk up to the restaurant with Megan and David while Amy and Mike went back to the ship to collect Hillary and Kate and hail a cab to dinner. We were starting to realize how cumbersome a group we were and that it would be impossible to fit everyone in 1 car anyway. Fortunately, we had a van reserved for our tour tomorrow. It took about 40 minutes to regroup outside of Kiva, but when we went in our table was ready. We had a prime spot for 8 by the open area looking out on the Galata square. It was the first night of Ramadan and the restaurant was empty at 7:00. The owner was so friendly and willing to talk to us about the choices. He decided to give us a special treat since we were so interested in the local delicacies. He had his staff prepare about a dozen dishes in smaller portions that we could all sample from. These included black-eyed pea and spinach salad, a seaweed salad, zucchini casserole, mushrooms in sauce, shrimp skewers, chicken curry and several flavors of rice. Needless to say, David was able to enjoy almost everything. He turned down the chicken, but loved the shrimp, and was excited about all the vegetables and rice dishes. Kate was very adventurous and even tried a taste of the seaweed! It was not until after 8pm that the locals started coming in to break their fast. By the time we were finished, the place was packed. Again, it was a mix of secular and orthodox attire. It made me realize that Islam is similar to all other religions in that way. You have control over how strictly you follow the rules and traditions. I myself only attend church on Christmas Eve. My husband no longer fasts on Yom Kippur. And while our children benefit from the holiday traditions of both faiths they have never been forced to go to Sunday School. As our tour guide told us the next day, she was conducting her job-including a lunch break- just like 60% of the other Muslims in the city. She planned to eat a special dinner with her parents as part of their tradition, but other than that she didn’t practice regularly. This all got me thinking about why the U.S. has such misperception about Muslims. Have we become so paranoid about terrorists that we have classified all Muslims as such? In reality, Islam is a very tolerant religion. It was founded on the practice of allowing other faiths to practice in exchange for a “jitzah”- a tax on non-Muslims which granted them religious freedom. Our fear has blinded us as to how similar we really are. There are extreme groups within any religious or political organization whose voices somehow carry more weight than those of the more secular masses. I am just glad that our family got to see first hand how these Turkish people lived and how friendly and welcoming they were. It was a great opportunity for us all to form (or reform) our own perceptions. As we walked back to our ship that night, we looked at the colorful lights illuminating the mosques and heard the final call to prayer. How fortunate we were to be able to observe such a wonderful blend of new and old religious celebration. Today we are sailing from Split all the way around Greece, up through the Dardanelles and the Bosphorus River- the location of many battles over the centuries- to Istanbul. As it turns out, we had to face our own battles- based on food. First of all, as I previously mentioned, there were too many tasty treats readily available. We tried to keep an eye on the kids in order to prevent them from gorging on sweets, but it seemed like we were always saying “No”. With three adults monitoring the situation, we slowly recognized how often this was happening and began to feel terrible. Wasn’t this cruise supposed to give them independence and personal responsibility? We became very distressed with ourselves. How can we be responsible for their eating habits without giving them all these limits? In the end we decided the reasonable thing to do was set some general guidelines on what to eat and how often, and hope they had more self-control than most children. This strategy may have given them 10 days of excessive eating, but it was better than fighting over the issue every day. In contrast, Susan who was underweight due to a shattering life change (mentioned earlier), was trying to put on a few pounds. She needed to learn some “bad” habits. She added croutons, nuts, olives and eggs to her salads, ate whole sandwiches instead of open-faced, and threw some chips or fries on the side. It wasn’t as easy as it sounds though. Her appetite had severely dropped and she was only able to eat small portions at a time. It probably didn’t help to keep checking in at the gym to see if she was putting on any weight. We made a plan for her to always eat with someone for company and to limit how often she was checking her progress. When we went to dinner tonight, we had a huge private table for 8. It was so wonderful to all be together and talk about our day. We shared our favorite shore adventures so far, the funniest things that had happened (for Kate, Amy and myself this was the pepper shaker story, which I’ll save for another time), or a report on the ping-pong matches of the day. This tradition of sharing while eating as a family has always been important to me- a value instilled when I was growing up. Ever since I was a girl, dinner has been more about socialization than actual eating. It was a family gathering time- a place to catch up with each other and share our day. My parents made this time an important family value and I continue to carry on this principle in my own home. Ever since my kids were little, I have enforced the 10 minute rule. This meant you must sit at the table for at least 10 minutes before you may be excused (remember when kids are little, 10 min is an eternity). As they have gotten older, we rarely have to enforce this rule unless someone is in a surly teenage mood. 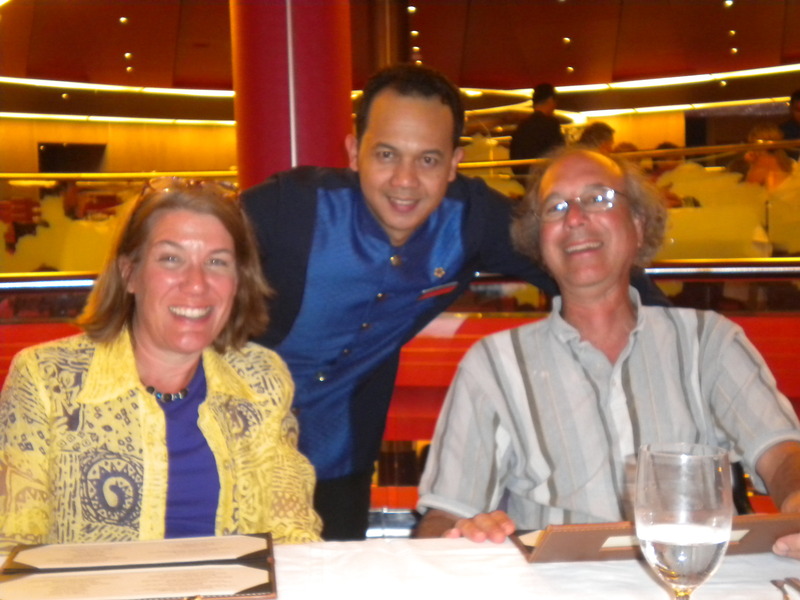 Obviously on this cruise, our dinners lasted over an hour and we had plenty of time to talk. The thing that really impressed me though, was the variety of foods the kids were willing to try- watermelon soup, stuffed mushrooms and even tuna tartare. They may not have liked them all, but some were surprisingly delicious. I was just proud of them for trying. Sometimes, trying new things can backfire, though. On this night, David decided to be adventurous and order the roasted quail. He took a few bites of it and then recognized that his dinner had once been a real bird- similar in size to the pigeons he loved in Venice. He politely excused himself from the table, saying he didn’t feel well. When I went to check on him later, he was very upset. He declared he was never eating animals again. David is a very compassionate person and when he makes a decision on a principle it is very difficult to dissuade him. I tried to be supportive, figuring it would only last a few days (I was so wrong and this became a concern as time went on). Do you know how hard it is to support your child when you are concerned that their decisions will have a negative effect on him? I have certainly done enough research on healthy eating habits to know vegetarianism can be very beneficial if done correctly. There were multiple vegetarian options on the cruise menus so I was not concerned about what he could find to eat, but Mike and I did convince him to continue to eat fish as a source of fat and protein. For the remainder of the cruise, David declared himself a Pescatarian and enjoyed all the fruit, vegetables and sushi he could possibly eat. The compelling thing about a cruise is that you tour the land by day and travel great distances on water at night. So by the time you wake up the next morning, you can be far away. In our case, we had travelled across the Adriatic Sea to Split, Croatia. Neither Croatia nor our next stops in Turkey were places I would have considered making a separate trip to, but that was the appeal of the cruise. I couldn’t imagine getting there any other way. 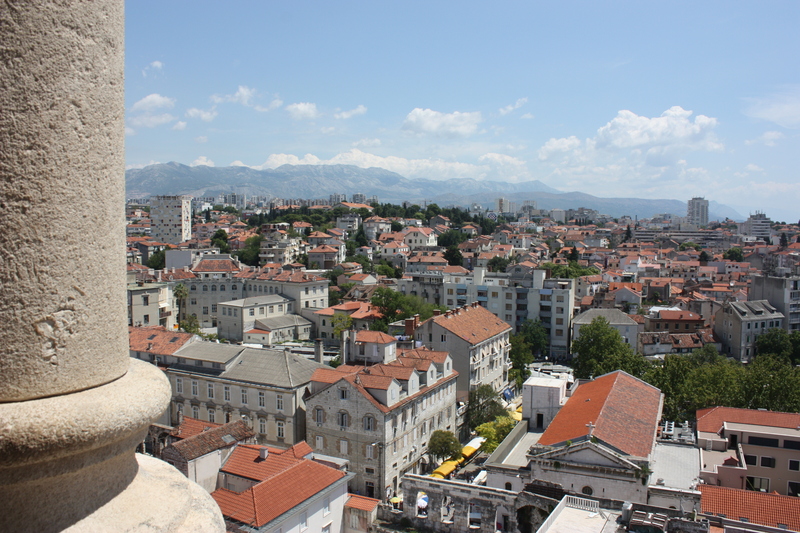 Split looked like a charming little town with a historic palace, market place and some museums to explore. 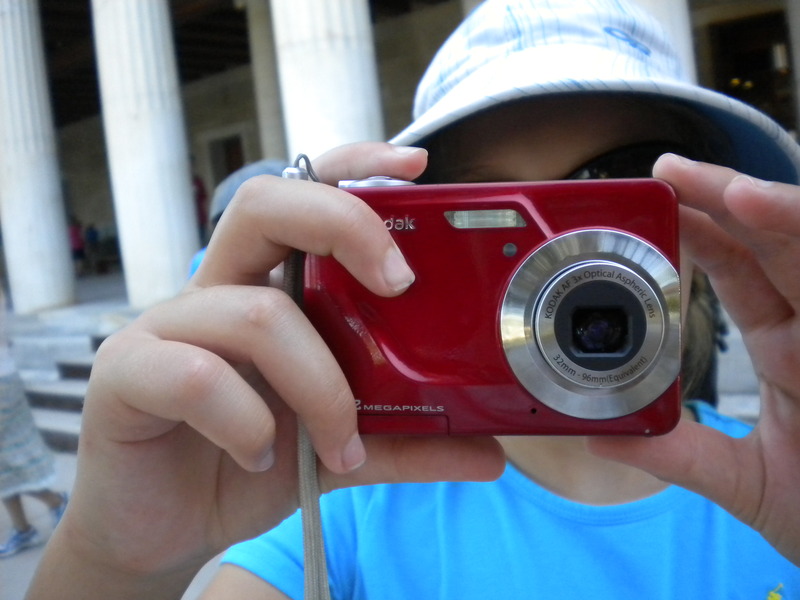 Mike and I took the kids to the tourist attraction, the Diocletian Palace, while the other three adults visited the museum and market. 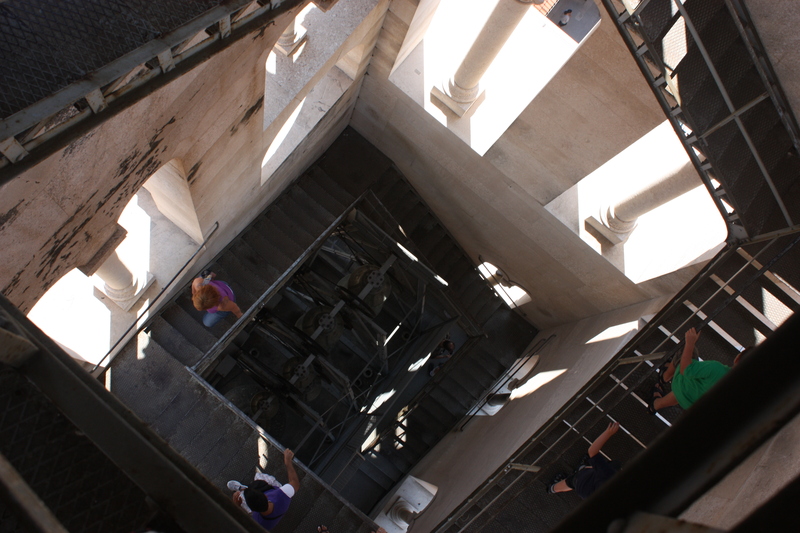 The palace was crowded, but once we climbed up the tower, we had great views of the town and out to sea. Unfortunately, the height of the stairs, as well as the rickety construction, gave Kate second thoughts about ascending. I felt bad that I had gotten her into this situation again. However, she bravely waited with me or Mike at one of the lower landings, while we took turns climbing. We were very proud of her ability to deal with the crowds and her appreciation of the old buildings we were seeing. Next we had fun wandering the market. David, always the animal lover, spotted a woman selling rabbits. He bent down to pat them, just as he had with the pigeons in St Mark’s Square. They took to him immediately. For the rest of the trip, he tried to convince me that he should get a pet rabbit when we returned home. After our tour, we stopped at a restaurant for pizza and salad. We sat at an outdoor table where we could watch the pedestrians from many countries walking by. While we were waiting for our food, I had my niece call home. I knew my sister would be anxious to hear from her and it was hard to get cell phone reception on the ship (not to mention very expensive). Predictably, Kate only gave her mom minimal answers; “yes”, “no”, “cool”; so when she was done, I took over the conversation, filling her in on the details of our trip so far. I remembered how much I had longed to hear from my daughter when she was away with her Nana last summer on the Baltic. My sister could not thank me enough for calling her. “You just made my day!” she exclaimed. 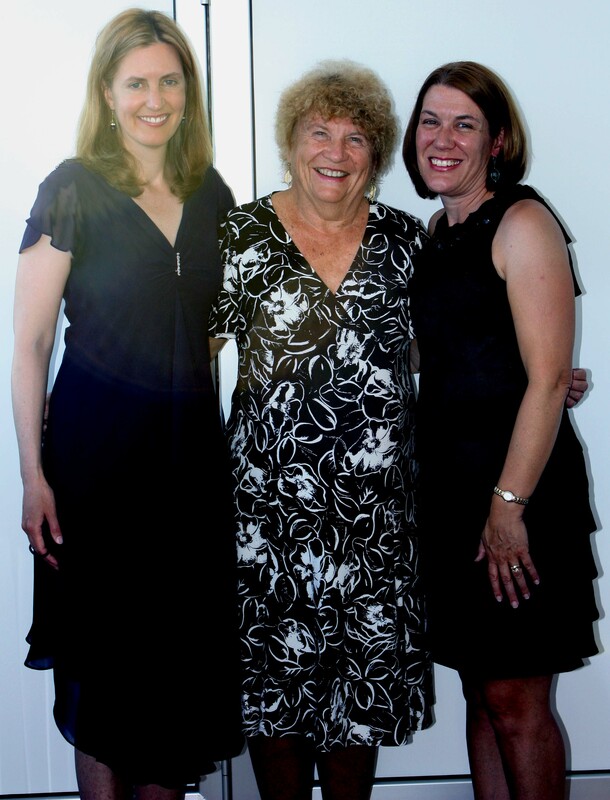 I am sure Kate knew her mom would want to hear from her; but, as children do, wanted to draw the lines between her life experiences and her parents’. Fortunately, she had no qualms about sharing this experience with her aunt- so we had plenty of fun moments together, which we will remember for a long time. After lunch, Megan, David and Kate explored the ship. They discovered the ping-pong tables, swimming pools, the basketball court and the Crow’s Nest. By the time they came back to the room, David had broken off his id bracelet, claiming he was almost 13 and shouldn’t have to wear it.So what is a responsible aunt suppose to do when Kate declared she wanted her’s off too? At first I tried to explain it was for her own safety. I told her if David had his off, she could still roam the ship with him and no one would care. I did trust David. He has a good sense of caution while being confident enough to try new things. However, here I was in the Mediterranean with my sister’s child who I perhaps felt over-protective of, (but you can understand why). So I felt completely torn between what was best for them both- safety or independence? As it turned out, no one really ever checked their bracelets. The ship was very secure and any time we exited, someone asked if the minors were accompanied by us. Kate tried to follow the rules about wearing the bracelet, but I could see that it was very uncomfortable- too tight and with a long tag hanging off. In the end, she managed to break it off when no one was watching, and that was the end of it. As the evening approached, everyone became more excited for Amy’s arrival. She had been travelling all day from the west coast of Canada. The last time we had seen her was at Christmas. There had been several family gatherings since then, usually on weekends, but Amy lived too far away for such spontaneity. Amy and her husband loved their jobs and their location, except for the fact that all of their family members were on the east coast. Having no children of her own, Amy treasured her nieces and nephews and was looking forward to this extended visit as a way to bond with them even more closely. Hillary (Amy’s & my mother) was beginning to appear anxious. All mothers worry about their children and Hillary was no exception. She was even more excited than I to have her family together and was already planning special activities with each one. I finally convinced her to take a walk on the promenade deck so we could get some fresh air and take our mind off the wait. It was relaxing to stroll around the ship and take in the views of Venice and the vaporetto action on the sea. On the way back, we stopped in my suite to see what the kids were up to. We found them hanging out on the couch with some fruit salad, french fries and Fanta. Obviously they had wasted no time ordering room service. At least they made one healthy food choice. Mike was sitting out on the verandah. When I stepped out to join him, my mouth dropped open and I blinked my eyes in disbelief. My surprise turned into pure joy as I stretched my arms out, shouting “Amy!” and ran around the table to embrace my weary but equally happy sister, who had just arrived and was sitting in the lounge chair. Hillary was four steps behind me and soon all three of us were entwined in a group hug. Love is a powerful magnet to draw people together. Coming from 5 states or provinces, in small groups or alone, for the sole purpose of a vacation shows a strong committment to what it means to be a family. Over the course of this cruise we intended to take every opportunity to strengthen our ties and replenish our stores of love for when we would be apart again. Today we all slept in a bit – trying to catch up on some shut eye. However, by 10 am we were repacked and ready to head to our cruise ship. Once again we each had to drag our suitcases up and down stairs and through narrow alleys until we reached our vaporetto stop. By the time we arrived at the dock, we were soaked with sweat. Everyone received a room key but David and Kate were disappointed to learn they needed to wear identification bracelets due to their age. This would become a point of contention later in the day. However, at this moment everyone was eager to check out their staterooms and explore the ship. We were staying on the Ms. Nieuw Amsterdam. We had booked a Deluxe Verandah suite for the four of us and I was pleasantly surprised by the size of our room! We had a king size bed, a large sitting area with ample room for the pull-out sofa, a spacious bathroom with 2 sinks and showers and a separate dressing area with plenty of storage space, including a large vanity. Our verandah was twice the size of the regular ones and had comfortable seating for 8 people- perfect for our whole group! I’ll admit I am an organization maniac and I set to work right away trying to figure out where to store four people’s stuff for the next 12 days. The guys were easy. They were able to share a closet and use some drawers. I found some drawer space for myself and used a closet for shoes and hanging things. That just left Megan’s stuff. I knew she had packed way more than she needed, but a 15-year-old girl needs her fashion and her make-up so we agreed that, as long as it fit in her suitcase, she could bring it. As it turned out, the dressing room was perfect for her. She could fit everything in the closets, lay her makeup out on the vanity and I could draw thew curtain on her mess so the rest of the room looked presentable. Problem solved! Since Megan and Susan were returning Mariners, they were able to attend a special Embarkation lunch and invited the rest of us as guests. 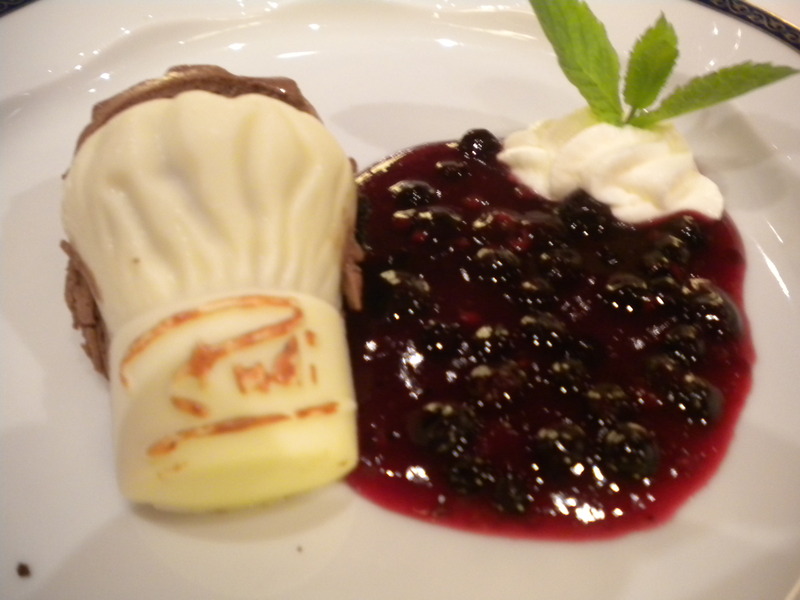 We walked in to the Manhattan Dining Room and were immediately impressed by how friendly and helpful the staff were. The choices of food on the menu indicated the luxury of the options we would have during our stay. Since it was only lunch, I skipped the appetizer and ordered a chilled asparagus soup and a raspberry walnut salad, followed by a scoop of watermelon sorbet for dessert. Everything was as delicious as it sounds! Little did I realize what a sensitive issue our food choices were to become during the cruise. At the outset of our trip, my mother-in-law was seriously underweight. Since being widowed less than 8 months ago, she had not been eating well. Compounded by the stress of her new situation and occasional depression, she looked shockingly frail. Her goal was to put on 5 pounds and revive her spirit on this trip. Kate, on the other hand, had been sent on this trip by her mother- who tried to maintain healthy eating habits at home and asked us to be mindful of sticking to them. With so many courses to eat and tantalizing desserts everywhere we looked, we quickly knew this was going to be a challenge. The remaining members of the group, myself included, were foolishly trying to enjoy a variety of foods without gaining a pound. This idea seems ridiculous in retrospect, as there was always good food available at the Lido buffet, in the Neptune Lounge or by ordering room service. Fortunately, none of this was on my mind as we finished our first meal. Everyone smiled at each other and complimented the waiters on how delicious everything had tasted.